According to NOAA, June of 2017 was the third hottest such month in the global climate record since temperature tracking began in 1880. For NASA, June was also the third hottest on record with June of 2016 settling in at 1st hottest, and 2015 and 1998 tied as second hottest. Overall, global temperatures were about 0.91 degrees Celsius warmer than late 19th Century averages in the NASA record and about 1.02 degrees Celsius warmer than the same time period in the NOAA record. Around the globe, various climate extremes were quite visible as a result of such considerable warmth. Arctic sea ice extent was 6th lowest on record according to NSIDC while Arctic sea ice volume was the lowest ever recorded according to PIOMAS. NSIDC also found that Antarctic sea ice extent was the second lowest on record. Combined, global sea ice area was the lowest ever recorded. Weather disasters included severe hydrological events likely influenced by increasing atmospheric water vapor content and evaporation rates due to climate change. These comprised Bangladesh’s devastating June floods and a still ongoing African drought spurring worsening hunger and increasing instances of mass migration. Meanwhile, seven maximum temperature records were broken with the highest temperature ever recorded in Asia during June occurring at Ahwaz in Iran on June 29 and an all-time national June heat record set in the United Arab Emirates on June 16th. Notably, no new all-time cold temperature records were set across the globe during June. If present trends continue, 2017 is now on track to be the second hottest year in the global climate record. This despite a noted lack of El Nino in the Pacific following a very weak La Nina during late 2016 and running into early 2017. Though not as warm as 2016, it appears that 2017 will range about 1.1 C above late 19th Century values in the NASA record (according to analysis by Gavin Schmidt) along the current path. This is a very warm range that is likely to keep pushing the climate system into gradually more extreme conditions. Atmospheric CO2, which is rapidly rising due to rampant fossil fuel burning, is likely to average around 407 ppm in 2017. As a result, global atmospheric heat forcing is on the rise with the trend likely to continue upward pending a major reduction in greenhouse gas emissions. Meteorologists, climate scientists, risk experts and climate journalists should therefore remain on heightened alert for dangerous trends related to global climate change. According to NOAA, carbon dioxide — a key heat trapping gas — increased its atmospheric concentration by 2.77 parts per million during 2016. This was the third fastest rate of increase in the NOAA record following 2015 at a 3.03 ppm annual increase and 1998 at a 2.93 annual increase. Earlier trends had indicated that 2016 might be on track to beat 2015 as a new record year (and a month by month comparison for the first 11 months of 2016 pointed toward a record rate of rise). These concerns, thankfully, did not materialize as atmospheric rates of accumulation slowed down during December of 2016 — which helped to push the overall year to year comparison lower (NOAA’s year-on-year rate of growth is based on a December to January comparison). Nonetheless, the high rate of atmospheric increase for 2016 remains a matter of concern. Overall, the average annual rate of increase for the first six years of the decade beginning in 2011 was 2.42 parts per million. This rate is approximately 20 percent faster than during the decade of 2001 to 2010 (analysis based on this NOAA data) at around a 2.05 parts per million annual increase. Prior to the most recent decade, the 2000 to 2010 period showed the fastest rate of atmospheric carbon dioxide accumulation on record. El Nino, through ocean warming and related land impacts such as increased droughts and wildfires, can reduce the rate of CO2 uptake by the Earth System — thus forcing a higher rate of increase due to the human emission. And the 2015 to 2016 period featured a strong El Nino. All things being equal, we should expect atmospheric rates of increase to moderate somewhat during 2017. Possibly dropping to slightly below 2 ppm in the best case. However, global carbon emissions from fossil fuels at near record levels will continue to push a very high rate of atmospheric accumulation of this climate change driving heat-trapping gas. And the added insult due to global warming now ranging above 1 C hotter than 1880s for most years will tend to put a cap on how effective the Earth is at taking in the very large excess human emission. By comparison, rates of CO2 increase during the last hothouse extinction event — the PETM — were about 10 to 20 times slower than they are today. And it took hundreds of years for atmospheric concentrations of CO2 to equal the same 125 parts per million increase we’ve now experienced in the 136 years since 1880. So the insult to the Earth System produced by fossil fuel burning is currently extraordinarily high and the rate of heat trapping gas accumulation is probably unprecedented for at least the last 66 million years. NOAA is now showing that global atmospheric CO2 averages are hitting near 402.5 parts per million. This level will likely increase to around 404 to 405 parts per million by the end of 2017. The forcing from this CO2 alone (not including methane and other greenhouse gasses which has pushed CO2 equivalent forcing to around 490 parts per million) is enough to push global temperatures to nearly 2 C warmer than 1880s averages this Century (prediction based on ECS model analysis). Longer term, if atmospheric CO2 concentrations remain so high, overall warming could hit 3 C to as much as 4 C hotter than 1880s values when adding in the long-term impacts of other greenhouse gas emissions (prediction based on a meta-analysis of paleoclimate temperature and atmospheric carbon proxies). With global temperatures already driven to about 1.2 C hotter than 1880s during 2016, it’s not an understatement to say that a period of more dangerous and harmful climate change — forced upon us by the world’s extremely high rate of carbon emissions — is already upon us. And we can see that in the various severe weather and geophysical events that are currently ranging the globe. The urgency for cutting carbon emissions, therefore, could not be greater. July 2016 was the warmest July in 136 years of modern record-keeping, according to a monthly analysis of global temperatures by scientists at NASA’s Goddard Institute for Space Studies (GISS) in New York. — NASA GISS. In 1998, the world went through a big heat wave. In just one year, global temperatures jumped by about 0.15 degrees Celsius above previous record highs. Riding on the wave of an extraordinarily powerful El Nino, atmospheric CO2 that was then in the range of about 365 parts per million (and CO2e — CO2-equivalent greenhouse gasses — in the range of 415 ppm) pushed global temperatures to around 0.9 C above 1880s averages by year-end. This extreme heat set off a rash of weather and climate disasters around the world. A global coral bleaching event sparked off. 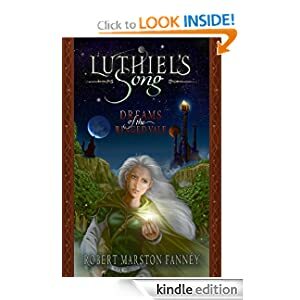 At that time it was only one of a few ever recorded and was seen by scientists as one of the early warning signs of global warming. Droughts, floods, and fires occurred with a then-unprecedented frequency. Some began to wonder if the bad effects of climate change were starting to take hold. But 1998 was just a mild foretaste of what was to come. 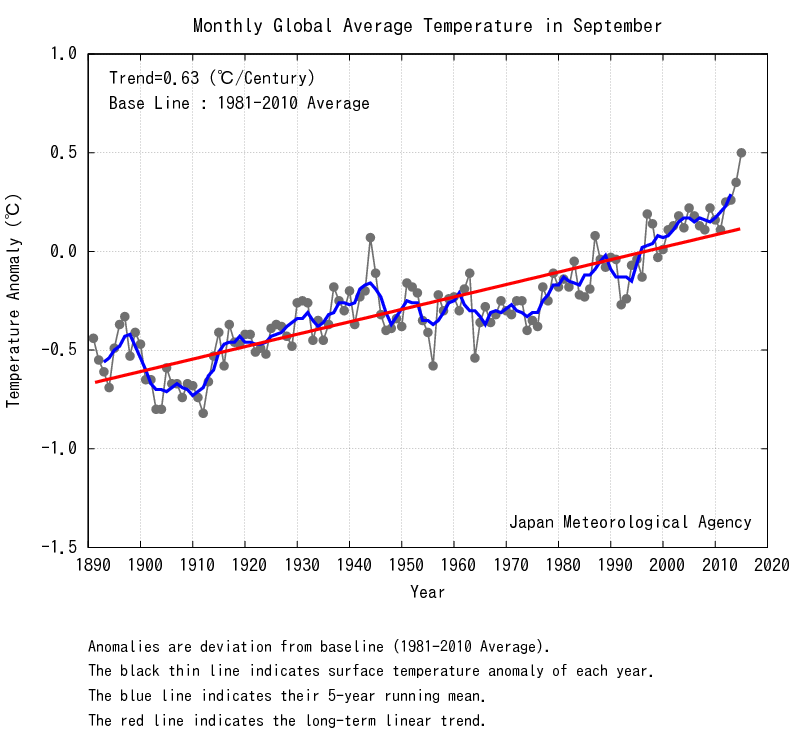 In the years that followed, new global temperature records were breached time and time again. 1998 was swiftly surpassed by 2005 which was again beaten out by 2010, then 2014 and finally 2015. Now, 2016 looks like it will end around 1.2 C hotter than 1880s averages. It appears that in just three years, the world will have warmed by more than 0.2 C. In the 18-year period since 1998 the world’s long and worsening hot spell will have increased its top range by as much as 0.3 degrees C, or more than 30 percent. July data are out, and what do you know, still 99% chance of a new annual record in 2016. Another way to sum up how much the world has warmed since 1998 is the observation that the coolest months and years going forward are likely to be hotter than 1998 average temperatures. In other words, if we saw 1998 global temperatures now, it would be anomalously cold. The Earth’s natural cycling between La Nina and El Nino is, at this time, highly unlikely to produce a year as cool as 1998. As for 2016, the unbroken tally of record hot months has grown incredibly long. July itself, in NASA’s most recent announcement, has come in at about 1.06 C hotter than 1880s averages (and 0.84 C hotter than NASA’s 20th-century baseline). This makes the month we just went through the hottest month ever recorded in the global climate record by a substantial 0.1 C margin (beating out July of 2011 as the previous record-holder). At this point, you have to go all the way back to September of 2015 to find a month that isn’t now a new record-holder. And, as you can see in the month-to-month comparison graph above by NASA, many of the recent records have been very strong indeed. Such heat has brought with it every manner of trouble. From droughts in the Amazon rainforest, to record-low sea ice levels, to worsening droughts, to a global rash of floods and wildfires, to the longest-running coral bleaching event ever recorded, to expanding ocean dead zones and lakes and riverways choked with algae, to tropical viruses like Zika marching northward as anthrax-carrying deer are coughed up out of the thawing permafrost, to the loss and destabilization of glacial ice around the planet, the picture of the world in 2016 is one of a place suffering far greater and wider-ranging climate disruptions than during 1998. Now, given the considerable difference in impacts over just an 18-year time period and an approximate 0.3 C temperature increase, imagine what another 18 years and another 0.3 C or greater would unleash. July was just one part of this big upward jump in global temperatures and related extreme climate conditions. The distribution of that heat showed that climate-change-related polar amplification was still in full swing up north. Above-average temperatures continued to concentrate near the vulnerable Arctic. NASA shows that temperatures in the region of 75 to 90° North Latitude ranged from around 1.4 to 2.1 C above normal. Such record-warm readings were likely due to loss of sea ice and consequent albedo reductions in the region of the Beaufort Sea and the Canadian Arctic Archipelago (see Arctic map here). Peak temperature departures in this zone hit as high as 7.7 C above average for the month — pretty extreme for northern polar July. Conversely, a small pool of slightly cooler-than-normal readings hovered over the East Siberian Sea. But this small region was far milder, achieving only a peak 2 C departure below 20th-century norms. The broader region from Latitudes 35° S to 75° N saw temperatures ranging between 0.7 and 1.4 C above the NASA 20th-century baseline. This included the Equator at around 0.8 C above average despite the cooling effects of the Eastern Pacific which was starting to tilt toward La Nina conditions. From 35° S to the pole, temperatures rapidly fall off for July with the region from 75° to 90° S seeing 1 to 1.6 C negative temperature departures. It’s worth noting that this Antarctic region was the only area to experience widespread below-average temperatures on the globe. Even so, West Antarctica stood as a noted warm outlier in this single large cool pool, with temperatures for most of the Antarctic Peninsula and adjacent inland regions hitting 4 C or more above normal. Cooler surface waters in the Equatorial Pacific are predicted to produce a weak, late La Nina for 2016 and early 2017. This event is not expected to be anywhere near as strong as the significant 2010 to 2012 La Nina. As a result, it will likely have a lesser overall downward effect on global surface temperatures. On the other hand, as August and September roll into October and November, Northern Hemisphere polar amplification is likely to intensify and this will tend to further buffer the downward temperature swing typically produced by La Nina. Therefore, it’s not likely that August to December temperatures will fall outside of the 0.95 to 1.15 C June-July temperature differential from 1880s ranges. Current GFS model tracking for August (see image above) hints at a likely range between 1.05 and 1.15 C above 1880s values, which means that August is currently on track to challenge previous all-time temperature records for the month and that 2016 is continuing to solidify its extreme heat gains. New national policy proposals from the four ruling parties of Norway spurred a flurry of headlines this week as leaders explored the possibility of banning all fossil fuel based vehicle sales by 2025. The country, which already has a 24 percent national all-electric vehicle sales rate — is pursuing ways to ensure that number grows to 100 percent in very short order. Note that these vehicles are of the all-electric, battery-driven variety and do not include hybrids or plug in hybrids like the Chevy Volt. Leaders from both parties within Norway were considering the ban which, if enacted, would dramatically reduce Norway’s vehicle fleet carbon emissions. Fully 90 percent of Norway’s electricity is generated by renewable hydro-electric power. And hooking vehicles up to this energy source would push their use and chain of fuel emissions to zero. A fossil fuel exporter, about 20 percent of Norway’s GDP comes from the sale of oil to the rest of the world. And this represents a bit of an irony in Norway’s policies. But Norway, for its part, appears to be very serious about transitioning away from fossil fuels and setting an example for the rest of the world. A challenge it will necessarily have to meet by diversifying its economy as global fossil fuel demand falls. Norway’s 5 million populace switching to all electric vehicles wouldn’t put a huge dent in global oil demand. But if other countries start to follow Norway’s lead, then a strong global trend could assert. Already, both the Netherlands and India are exploring similar policies — with the Netherlands looking to enact a 100 percent non fossil fuel vehicle fleet standard by 2025 and India exploring a similar option for 2030. Increasing electric vehicle capabilities, lower battery prices, and expanding electric vehicle production are now allowing countries like Norway to consider the possibility of fossil-fuel free automobile fleets. By 2017, both Tesla and GM will be offering 200 mile range electric vehicles from a price of under 35,000 US dollars. Sales of these two vehicles alone are expected to top 150,000 in 2017 and with Tesla seeing nearly half a million preorders for the Model 3, production is likely to continue to ramp up. Following expected trends, it appears that range performance and cost for the battery + electric motor combo will hit parity with fossil fuel driven vehicles by the early 2020s. Other measures of performance such as engine efficiency, noise, horsepower, particulate emissions, carbon emissions, and torque are all already superior in electric vehicles. From the standpoint of climate change, a shift to electric vehicles and away from internal combustion engines provides a number of systemic benefits. The electric engine is 2-3 times as efficient as an internal combustion engine and so it takes less energy power overall. This increased efficiency alone results in a net, large-scale conservation across the fuel chain. Secondly, electric vehicles have the option of powering their engines using wind, solar, or hydro. And in doing so, vehicle use and fuel based emissions both drop to zero. The only remaining factor of emissions related to electric vehicles are found in the materials used to construct EVs and in the supply chains used to transport vehicles components and finished products. And since transport emissions figure heavily in this aspect, a large-scale shift away from fossil fuel based transport will cut this number down as well. With many nations considering 100 percent fossil fuel based vehicle bans and with EV production and quality rapidly ramping up, it appears that there’s a possibility that a big chunk of modern transportation could be shifted away from fossil fuels over the next 15 years. And that event couldn’t come sooner — as the effects of catastrophic climate change appear to already be howling at the door. We had a number of preliminary indicators that February of 2016 was going to be ridiculously hot. And, according to new reports from NASA, those indicators appear to have born out. In short, we’ve just experienced a month that was more than 1.5 C hotter than 1880s averages. It’s not a yearly average in this dangerous range — but likely the peak reading from a very intense El Nino combining with the growing base forcing of human climate change. That said, it’s a foretaste of what could very easily happen on a 5-15 year timescale in the annual measure if fossil fuel burning and related carbon emissions do not radically ramp downward. According to NASA GISS, February of 2016 was the hottest February ever recorded by a long shot with global temperature departures hitting a never-before-seen above average range. 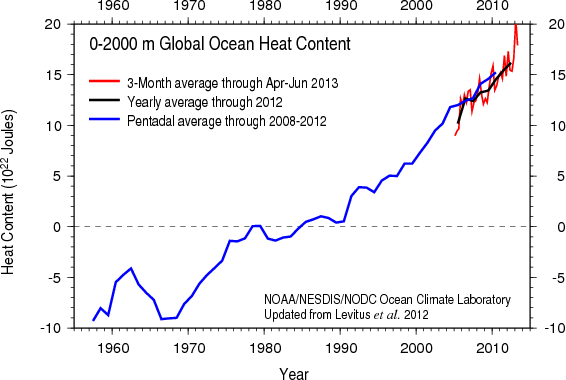 Land and ocean temperature averages hit 1.35 C above NASA’s 20th Century baseline (1951-1980). This extraordinarily hot global reading represents a 1.57 C departure from average temperatures in the 1880s. In other words, for one month during February of 2016, global temperatures exceeded the dangerous 1.5 C threshold. Japan’s Met Agency also showed February temperatures exceeding 1.5 C above 1880s averages. So we only await NOAA’s findings for final confirmation. Overall, these temperatures were the highest anomaly departure ever recorded in the NASA GISS monitor. The previous highest anomaly reading being January of 2016 at +1.14 C above 20th Century and +1.36 C above 1880s averages. Overall, the three month period of December, January and February hit an amazing +1.20 C above 20th Century averages or +1.42 C above 1880s averages. Overall, this three month departure is +0.51 C above peak three month departures during the 1997-1998 El Nino or a peak-to-peak warming from strong El Nino to strong El Nino at a rate of 0.28 C per decade. Such high peak to peak increases may imply an acceleration above the baseline rate of warming of 0.15 to 0.2 C per decade since the late 1970s. However, such above baseline rates of warming will need to also bear out in the post strong El Nino record before such a claim can be made with any confidence. Looking at the geographical distribution of these extreme, above average, temperatures we find a broad swath of record heat in the range of 4 to 11.5 degrees Celsius hotter than normal covering a huge swath surrounding and including the Arctic. A region stretching from just north and west of the Great Lakes including Northwest Canada, Alaska, the Beaufort and East Siberian Seas, the Chukchi, the Laptev, the Kara, a huge expanse of Europe and Asia stretching from Eastern Europe to Lake Baikal and north to the Arctic Ocean, the Barents, the Greenland Sea, the Northeast tip of Greenland and most of the region of the High Arctic above the 80 degree North Latitude line, all experienced these extremely warm readings. Still very warm 2 to 4 C above average temperatures surrounded much of this zone even as a broad 2-4 C above average hot spot is apparent over the record El Nino region of the Eastern Equatorial Pacific. Smaller regions experiencing similar 2 to 4 C anomalies include sections of Brazil and Columbia, a region over Southern Africa, Northern Australia and Northern New Zealand. Overall, very few regions show cooler than normal temperatures — though the cool pool just south and east of Greenland continues to stand out as a feature that is likely related to human-forced climate change. The disposition of extreme temperature departures centering over the Northern Polar zone is indicative of a pattern of extreme polar amplification during a strong El Nino year. As such, we can infer that the circumpolar winds did little to keep warm, Equatorial Pacific air isolated to the lower Latitudes and instead had weakened to the point that Equator to Pole heat transfer was facilitated. The temperature anomaly map at the top implies a warm meridional air flow issuing directly from the Equatorial Pacific and over the Northeast Pacific and Western North America. A second implied meridional wind pattern appears running from the Eastern Equatorial Atlantic over Western Europe and the Barents and Greenland seas. These dual Equator to Pole warm air slots appear to have helped to push High Latitude zonal anomalies in the polar region to very extreme warm temperatures for February with the highest departures approaching 6 degrees Celsius above average for the entire region north of the 80 degree Latitude line. Zonal anomalies remain high above the 45 degree North Line — hitting a steep slope from 2 C to 6 C as we progress northward. An Equatorial peak in the range of 1.3 C above average is also observed near and just south of the Equator. But despite an extreme El Nino, these departures are nowhere near those seen in the upper Latitudes of the Northern Hemisphere. Pretty much all zones except for the heat sink region in the 60s South Latitude over the Southern Ocean and the far south over Antarctica experienced above average temperatures for the month. The extreme polar warming, the visible warm air slots facilitating Equator to Pole heat transfer, and the overall very strong global temperature departure for February continue to express the signature of human forced climate change as predicted by many of the global model runs. The extreme Winter heat in the Arctic — while a sign of things to come during this strong El Nino year — is also an early blow to snow and ice in the Arctic for 2016 and 2017. Already, snow totals are at or near record low extent levels. 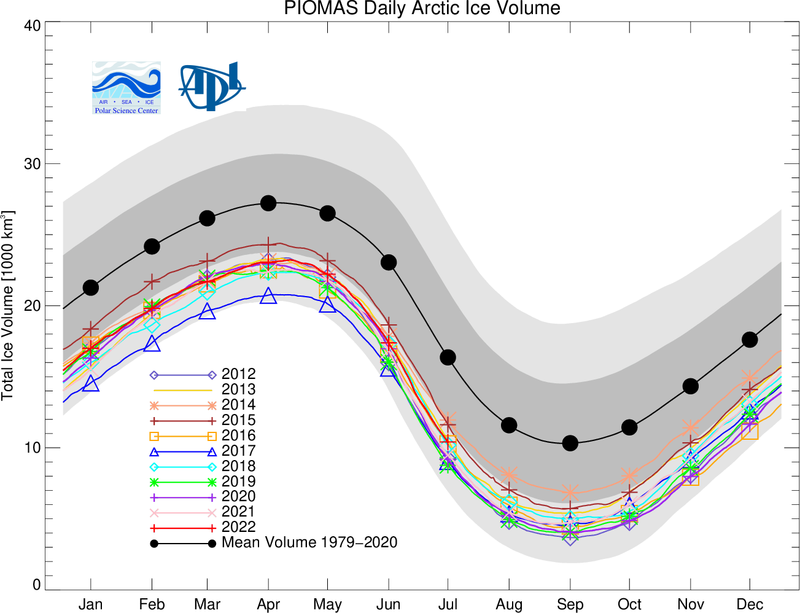 Meanwhile, sea ice volume during February returned to near new record low levels as measured by PIOMAS. As a result, the melt risk to both sea and land ice in the Arctic will likely be quite high over the next two years. It is worth noting, though, that February of 2016 will likely be the highest monthly temperature anomaly we see for some time. A record El Nino is fading away from peak intensity and NOAA is now predicting a 50 percent chance of La Nina conditions by Fall. We can expect to see global temperatures now begin to fall off a bit as a record El Nino starts to fade. To this point, 2016 will likely hit a departure range near 1.2 or 1.3 C above 188os values. Post 2016 temperatures will likely hover up to 0.2 to 0.4 cooler than those values during La Nina years, with new global records possible at the onset of El Nino again in the 3-5 year timeframe. To be very clear, though ENSO sets the short term trend, the long term trend is governed by a human forced accumulation of heat-trapping gasses. And as long as that continues, the heating we’ve experienced will also continue. Finally, since we are now very close to hitting dangerous 1.5 and 2.0 C warming thresholds (possible within 5 years for 1.5 C and 15 years for 2 C in the worst case), we should be very clear that we are just passing the most recent peak in a long progression. The trend, therefore, is up and we have now been thrust into more dangerous times. For NOAA, it looks like we’re well on the way toward seeing one of the most powerful El Ninos ever recorded. And already, there’s some brutal Fall and Winter weather events starting to emerge as a result. One event, in particular, is today roaring into the US West Coast like a Godzilla-hurled freight train. 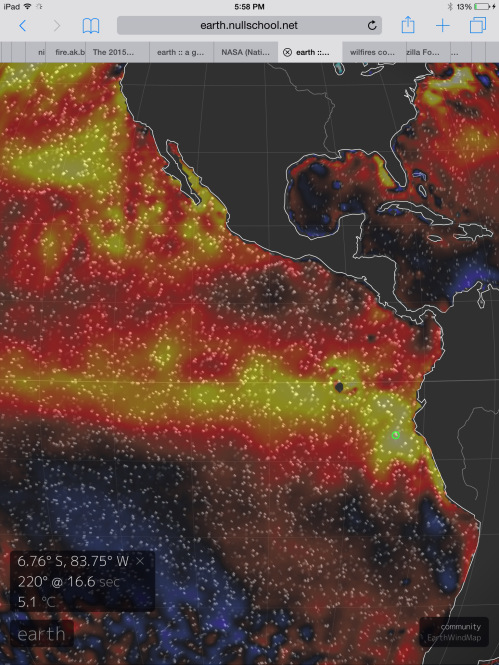 It’s just one upshot of a Monster El Nino in a record warm world. A weather and climate event — one likely pumped up by an overall atmospheric warming of 1 C above 1880s levels — that will likely continue to have severe and worsening global impacts over the coming months. NOAA’s September, October, November ONI Index, the key zone for measuring El Nino strength, hit a +2.0 degree Celsius positive anomaly this week. That’s just 0.3 C shy of the most powerful El Nino ever recorded — 1997-1998 which peaked out at +2.3 C in the same monitor. With October, November and December likely to show even hotter overall readings for the Central Equatorial Pacific, it appears that the 2015-2016 El Nino will strike very close to this ONI high mark. Peak weekly sea surface temperature values already exceeded top 1997-1998 temperature levels for NOAA (+2.8 C for 1997-1998 vs + 3.1 C for 2015-2016). So we wait on the ONI three month measure for October, November and December to give broader confirmation. 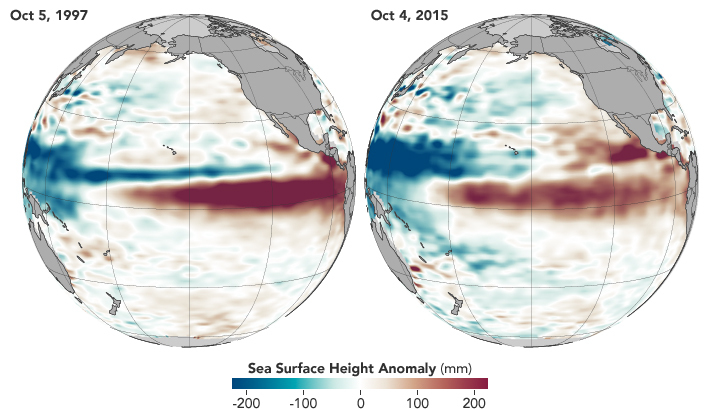 The 2015–16 El Niño is strong, and likely to rank in the top three events of the past 50 years. Presently, several key indicators fall short of their 1997–98 and 1982–83 values, both in the ocean (e.g. sub-surface temperatures, which have peaked around +8 °C this year, compared to +12 °C in 1997–98), and atmosphere (e.g. SOI, for which monthly values peaked around −20, while 1982–83 had several months at −30). Based on a reading of these two analysis by expert agencies, we revise our previous statements to come into line with NOAA and BOM forecasting. Though it’s still possible that 2015-2016 may exceed peak 1997-1998 intensity, it is more likely that the current El Nino will fall into the range of the top three most intense such events. This is likely due to the fact that El Nino has probably already peaked and that though some indicators show 2015 as exceeding 1997-1998 in intensity (NOAA weekly SST values), the broader, long-term indicators still rank 1997-1998 as the most intense in the modern record. That’s not to say that related weather events won’t be quite extreme. In some respects, hottest ever atmospheric and ocean temperatures on a global basis provide even more available energy for storms, heavy rainfall, droughts, and wildfires. Globally, the Earth has warmed by between 0.2 and 0.3 C from peak 1997-1998 atmospheric temperature values to those we are likely to experience during 2015 and 2016. That means rates of evaporation and precipitation have increased by about 2 percent overall. In addition, new climate instabilities have tended to arise due to increased rates of glacial melt, polar amplification (especially in the Northern Hemisphere), and related ocean surface warming along with the weakening of some of the major oceanic heat conveying currents. A top 3 strongest El Nino firing off in this global climate environment is, therefore, not entirely the same creature as a Monster El Nino firing off during the 1980s or even the 1997-1998 El Nino. In particular, the added atmospheric moisture loading, the slowing down of the Gulf Stream off the US East Coast and related back-up of warm water in that region, and the added rates of evaporation due to overall warming of the Earth-Ocean system present potentially more severe drought hazards for regions like Brazil and Australia, potentially more severe extreme storm hazards for the US West Coast as the storm track ramps up, and potentially more severe Winter oceanic and coastal storm hazards for the US East Coast, the North Atlantic and the United Kingdom. The US Southwest and South-Central California are especially vulnerable to severe flooding events during strong El Ninos in the December, January, February timeframe. Such events can deliver powerful rivers of tropical moisture to this region. Called Pineapple Express, these atmospheric rivers can develop along an arc running from the Equator, through Hawaii and then terminating over the US Southwest. The most extreme of these events have the potential to deliver 200, 500, or 1000 year deluges resulting in many feet of rainfall for the Central Valley region. A situation that some researchers have called an Ark-Storm and have linked to the (likely El Nino-related) Great Flood of 1862. In today’s context, we have one of the top 3 strongest El Ninos firing off in an atmosphere that, due to human forced warming in the range of 1 C, sees an overall 7-8 percent increase in the rate of evaporation (vs 1880s contexts) and precipitation. So any river of moisture that does develop may likewise become further engorged than was previously typical, thus resulting in more severe rain storms and a related heightened flood risk. It’s a risk, that in any case, FEMA disaster managers are taking very seriously. As officials issued warnings and FEMA managers drilled in Southern California, another powerful storm packing 60-80 mile per hour winds, heavy rains, and 43+ foot waves roared into the US West Coast this week. The 960 mb storm kicked off coastal flood, gale and storm warnings from Northern California through Washington State. Interior flood warnings were also issued as between 4 and 18 inches of rain fell over the past 3 days with 2-4 inches more expected today. The event had already spurred over 9 landslides even as, according to the Weather Channel, more than two dozen river gauges had topped flood stage across Washington and Oregon. It’s a heavy soaking that began in November and just keeps getting worse with each new storm. 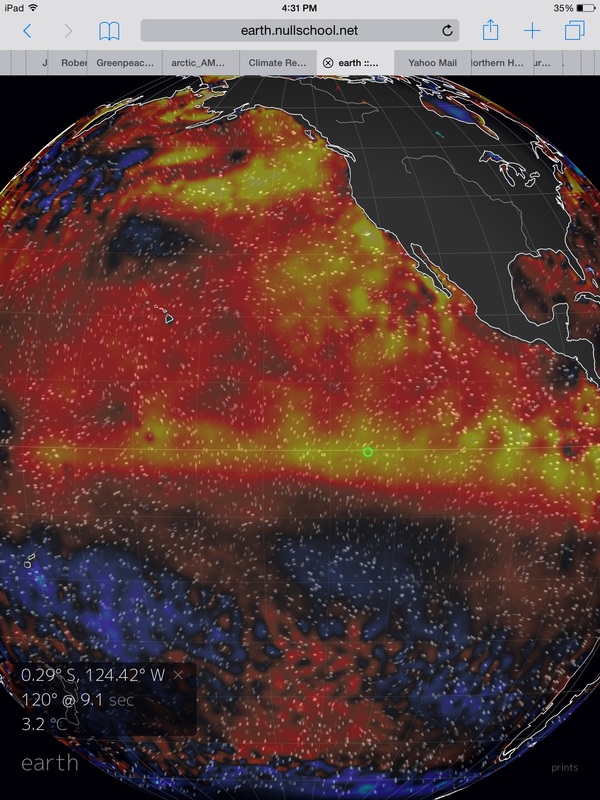 These storms are fueled by a powerful flood of heat and moisture boiling off the Godzilla El Nino in the Pacific. A dynamic that’s generating an extraordinarily powerful Pacific storm tack. This week, models predict another extreme storm — one that is expected to bomb out as a 930 mb monster packing 75 kt winds and 52+ foot waves in the Bering Sea between Russia and Alaska. 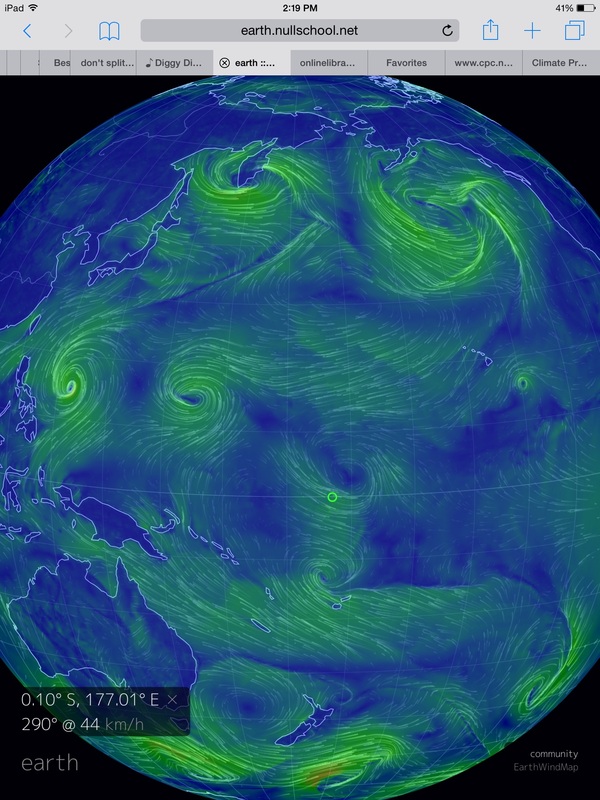 And given the way El Nino is charging up the atmosphere, these Pacific beasts are bound to keep roaring on in. “Over North America, this winter will definitely not be normal. However, the climatic events of the past decade make ‘normal’ difficult to define.” — Bill Patzert, climatologist at NASA’s JPL speaking in Earth Observatory today. It’s official, as of this Monday’s weekly NOAA ENSO report, a still growing 2015 El Nino had taken yet one more step into monster event territory. Hitting a +1.5 C sea surface temperature anomaly in the benchmark Nino 3.4 zone over the period of July through September even as weekly values rocketed to an amazing +2.4 C above average, the 2015 El Nino heightened yet again — making a substantial jump in overall ocean heat content. But according to a recent report out of NASA’s Earth Observatory, it appears we’re just beginning to see the full potential of this thing. Ocean surface heights, as seen in the Earth Observatory graphic above, now show a pattern very similar to the monster 1997-1998 El Nino. Supporting NASA’s conclusions that El Nino intensity during 2015-2016 may hit near or beyond the top of the chart is a recent intensification of westerly winds over the Western Equatorial Pacific. 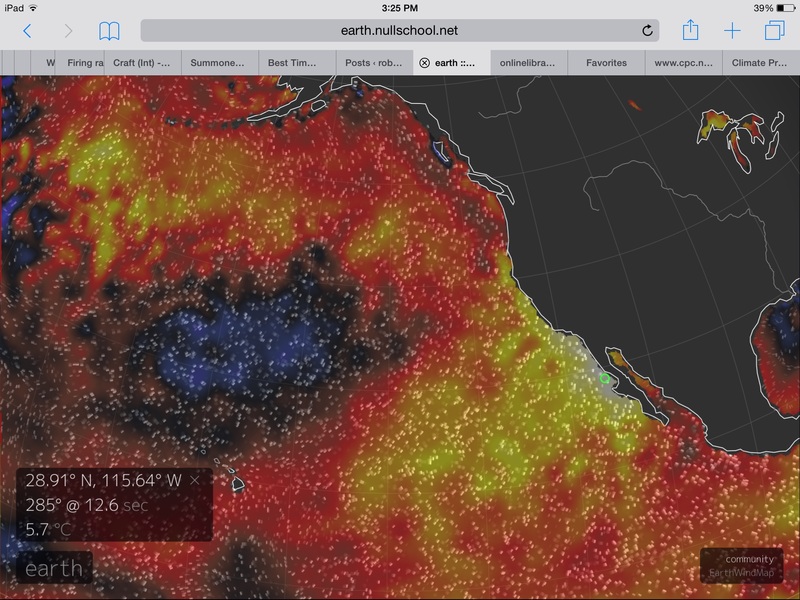 Throughout 2014 and growing into 2015, these westerly wind bursts have fed El Nino by pushing warmer, Western Pacific waters eastward — thus increasing ocean heat content in the El Nino zone to near record levels. A typical powerful El Nino of this kind would tend to drive a very intense train of moisture into the West Coast of the US, make for a cool and very wet winter across the southern US, and drive warmer temperatures and drier conditions across the northern tier. Climatologists, however, are uncertain how interactions between the current powerful El Nino and a globally changing weather pattern set off by a human-forced warming of the atmosphere to 1 C above 1880s levels (or about 1/4th the difference between the 20th Century and the last ice age, but on the side of hot) will interact. Very warm sea surface temperatures, likely due to both a climate change-forced heating of ocean surface waters and a weakening of the Gulf Stream, off the Eastern Seaboard hint that storms along the US East Coast and particularly for the US Southeast may hit extreme intensity if an El Nino associated trough digs in. Meanwhile extraordinarily intense sea surface temperature anomalies in the range of +2 to near +6 C above average off the US West Coast associated with a ‘hot blob’ that has lingered in this region for many seasons has caused some to question whether California will see the high intensity rainfall events typical of powerful El Ninos during the latter half of the 20th Century. For the US West Coast, the region may be balancing on a razor’s edge. If El Nino is strong enough to overwhelm the atmospheric and ocean inertia generated by the hot blob, storms running into that region could be extremely intense. On the other hand, if the hot blob holds or deflects the moisture stream northward, California may not see a drought-busting delivery of rainfall (See Godzilla El Nino vs the Hot Blob). But what we do know is that the ocean-to-atmosphere heat back-up generated by what could be a record El Nino, when combined with the enormous added heat forcing provided by human fossil fuel emissions, will almost certainly set new global high temperature records for 2015 and possibly for 2016. This, unfortunately, means that we’ve already started on a dangerous path toward the far more disruptive +1.5 and +2 C above 1880s benchmarks. A range that many scientists associate with a greatly increased risk of hitting climate tipping points.